My aging Blue iBook is suffering from a lack of space. This machine shipped with a 10 GB hard drive way back in 1999. Since I launched theseoldgames.com, the need for installation space has gone up noticeably. Ifixit.com has wonderfully detailed instructions for repair of a variety of consumer products, including the iBook. They are my "go to" site for most repair projects. However, replacing the iBook drive has 10 sections, 36 steps and no time listed for the upgrade. It is also marked difficult. Since I trust them, I believe that this is within my skill range, but will exceed my patience for the task. When I upgraded my old computers hard drive the task took all of an hour. This is a much bugger project, one I am not convinced that I ready to start. 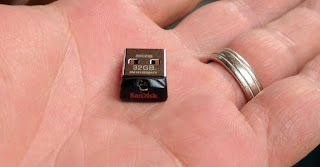 I had been using a USB thumb drive as an alternative to upgrading the drive, but having a little dongle sticking out the side of the computer was always a recipe for disaster. 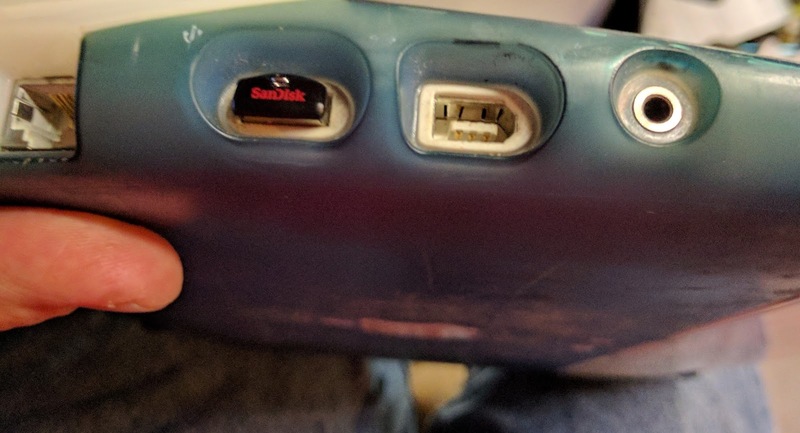 What if I broke the one and only USB port? Well, that is where the SanDisk Cruzer Fit USB drive comes in. It's a tiny USB drive with more than adequate storage. This 32 GB drive was less than $20.00, on Amazon. Now you can get several of them for a little less than $35.00. The SanDisk Cruzer would not be my first pick because I am clumsy and forgetful. Under normal circumstances, I would lose this thing in less than a day. However, once it is plugged into the iBook, it's sleek, small form is perfect for this machine. As you can see in the next picture, the SanDisk Cruzer doesn't extend past the edge of the case. Perfect! Drive problem solved, no particular downsides other than loosing the use of the USB. Aside from a floppy drive and Wacom Table, I have nothing that uses that port. To be honest, I won't need to use either one for this laptop. One caveat when plugging any drive into a OS 9 Mac - Sometimes the Mac will want to initialize the disk into a flavor or form it can use. Most modern machines do not have this problem, so plugging the drive into the Mac first, formatting if needed, then putting information on it using a different machine is the route to go. In a perfect world I'd upgrade the hard drive, but this solution is so handy compared to the real fix, I'm gonna run with it. Cons: Can't boot from USB. Utilizes the only USB port on the machine.